^ Top 50 peaks: "Discography Kaiser Chiefs". Australian-Charts.com. eMedia Jungen. Retrieved 14 July 2011. ^ "Discographie Kaiser Chiefs". AustrianCharts.at. eMedia Jungen. Retrieved 14 July 2011. 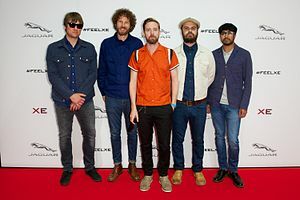 ^ "Discografie Kaiser Chiefs (FL)". ultratop.be. Hung Medien. Retrieved 14 July 2011. ^ "Chartverfolgung / Kaiser Chiefs / Longplay". MusicLine.de. PhonoNet. Retrieved 14 July 2011. ^ "Discography Kaiser Chiefs". Irish-Charts.com. eMedia Jungen. Retrieved 14 July 2011. ^ "Discografie Kaiser Chiefs". DutchCharts.nl. Hung Medien. Retrieved 14 July 2011. ^ "Discography Kaiser Chiefs". Charts.org.nz. eMedia Jungen. Retrieved 14 July 2011. ^ "Hit Parade Kaiser Chiefs". SwissCharts.com. Hung Medien. Retrieved 14 July 2011. ^ "Billboard Artist Chart History: Albums". Billboard. Nielsen Business Media, Inc. Retrieved 14 July 2011. ^ a b c d . British Phonographic Industry. 17 February 2006. Retrieved 2 September 2007. ^ "ARIA Charts - Accreditations - 2006 Albums". Australian Recording Industry Association. Retrieved 7 January 2009. ^ "IFPI Platinum Europe Awards 2006". International Federation of the Phonographic Industry. Retrieved 2 September 2007. ^ "ARIA Charts - Accreditations - 2007 Albums". Australian Recording Industry Association. Retrieved 7 January 2009.